BHP has awarded a $16 million overland conveyor belt contract to Fenner Dunlop at its South Flank project in Western Australia. Fenner Dunlop will provide around 50 kilometres of a low rolling-resistance conveyor belt, representing the largest order for the company’s Kwinana steel cord plant in almost 10 years. It considers its ability to manufacture locally in Western Australia and proximity to South Flank a vital component of the partnership. The large racetrack reels will be manufactured by JAF Engineering, and will maximise reel length and reduce installation time and splicing on site. JAF Engineering, part of Fenner Dunlop Australia’s group of companies, specialises in light to heavy fabrication and multi-disciplined engineering. 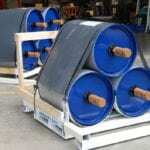 It has a long history in supplying custom made reels for the conveyor belt industry. “We’re looking forward to working with BHP on this new project, improving their conveyor performance and supporting them in the expansion of their operations,” Fenner Dunlop project manager Scott Ryan said. South Flank, budgeted at $US3.4 billion ($4.7 billion), is one of the most expensive mines being developed in Australia. 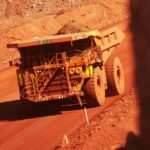 It will replace the Yandi mine as BHP’s premier iron ore operation once operational. The mine will produce around 80 million tonnes of iron ore a year. BHP has recently awarded other contracts at South Flank, including a $108 million construction contract with Monadelphous and $48 million fabrication and assembly contract with Civmec.